Washers and Dryers just go together. Mine match in color (white w/ rust spots) and style (fairly old) and have been with us for many years. I love them both: battered and slightly unattractive though they may be. They are both faithful and hard-working. We've called the repair man in only a few times through the years and he says the same thing every time: "They just don't make them like this any more." In every romantic/life relationship there is a washer and there is a dryer. It is fairly simple, with very few bells and whistles. It works without fuss, without changing from cycle to cycle---no dramatic shifts in temperature or movements. It does its job and does it well. All it needs from time to time is the opportunity to vent--to clear out the lint that accumulates over time. Every once in while the accumulation of small debris builds up and impedes its task at hand. This is a hazard to all around. Though the removal of this lint is not always pleasant, done regularly it helps the dryer to maintain its even temperature and long life. This one is a little more complicated. There's more moving parts, more cycles. Filling up, churning, draining, spinning, rinsing, more spinning. It's a lot of work to be a washer. It must be given the appropriate liquids for it to be effective. It must be constantly reminded to soften its contents as well as clean them. In the most dramatic of scenarios it overflows and wrecks havoc on its surroundings. When it becomes even slightly unbalanced, everyone around knows about it by the noise it makes, but the dryer is the most affected as the washer moves itself over to its steady, faithful partner who feels the bumping, bumping, BUMPING against its side. Who are you in your relationship? Are you the washer or the dryer? 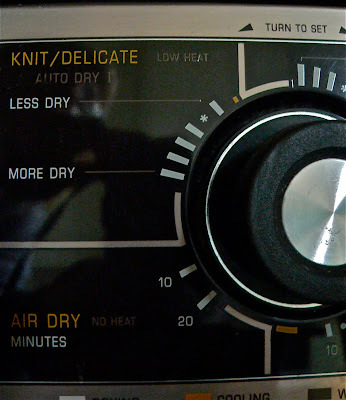 Though HOB might disagree, I consider myself to be the dryer. I am happy just to do my job and as long as I occasionally get to vent and clear out the cobwebs, I am fine. I am a pretty low-maintenance kind of person. Although some unenlightened people would mistaken me for a none-too-exciting, I am dependable and reliable. I like the security of routine. HOB is the washer. He is a hard worker, a faithful partner, and his intentions are good. However, he is always coming up with new ideas on the spur of the moment: "Let's go to Moscow!" "Let's buy a condo in Vegas!" "I'm buying a truck tomorrow!" He exercises at ungodly hours. goes to bed late, spins and refills, and yes, agitates at times. He comes over to bump, bump, bump against me as I am trying to do my rote chores of everyday life. Sometimes it's merely unnerving, sometimes it's maddening and sometimes it is exactly what I need. And so, as Valentine's Day approaches, I want to say Happy Valentine's Day to my washer/partner. Thanks for standing beside me, working hard, and yes, even bumping me out of my routine once and awhile. Also, thanks for letting me clean out my lint trap every so often. After all these years, I still warm up just for you. I promise to remember I have more than one setting and to occasionally flip from Timed Dry to Permanent Press just for some wild variety on my part. Note: For your convenience Betty's Washer/Dryer Theory of Relationships can quickly and easily be applied to other-than-romantic relationships, such as work and friendship. Step forward and proclaim your identity! I get wrung out sometimes and more than once I've been left hanging out to dry. Oh yeah, I've been taken to the cleaners, too. I am a dryer...no fuss at all...quite practical most of the times. Hubs also is a dryer but a bit temperamental I must say. He churns to his own rhythm and can get clogged up quite often.